Awnings have moved from functional sun and rain coverings to architectural additions that can simultaneously enhance a building's exterior charm and communicate the business owner's message. Before air conditioning was invented, the primary purpose of an awning was to provide shade from the summer sun. Storeowners folded up the retractable awnings for the winter months. 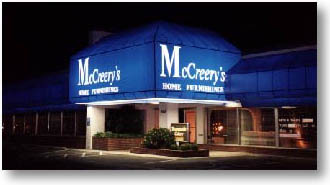 Today, awnings are more often installed for advertising than for weather protection purposes. Retailers and restaurants, among others, have adopted awnings as signage and the result is a more attractive storefront that communicates the brand. Experts say awnings present revenue opportunities, and companies are offering some innovative new material, design and installation options to help signmakers profit from this advertising trend. But before you even begin choosing materials or thinking about design, experts suggest conducting a survey of the building. Take a camera to photograph the exterior, investigate the fire and installation codes, and ask the owner lots of questions before starting the job. The type of business, its hours of operation, and the architectural style of the building all play important roles in selecting the awning style, graphic design elements, substrates, and method of installation. If installers show up with a 40-foot awning, for example, and there are encumbrances on the wall that the awning won't fit around in middle of the wall, then you are costing your shop time delays and financial losses. Planning is essential. Once you understand the customer's needs you can choose the awning fabric. Flexible-face materials are revolutionizing the use of awnings. 3M's films, Cooley's eradicable and seamless white awning substrates, and Glen Raven's Firesist are among the most popular solutions on the market. 3M's Panaflex is a flexible face system used by many signmakers for canopies, awnings and seamed pylons. Signmakers note this substrate's built-in resistance on its smooth, semi-gloss surface. A polyester scrim embedded between white-pigmented vinyl layers makes the material durable. Cooley, the first company to develop translucent materials for signs and awnings, recently introduced its Cooley-Brite II eradicable substrate with an eight-year warranty. The Coolthane Enhanced Protection System, a clear, protective layer, makes the material more flexible and durable than most other options. Seams frustrate sign makers because they can detract from the awnings' appearance. Some jobs, then, require a wider, seamless material. Cooley recently introduced its Coolflex 5 Meter Seamless substrate. Coolflex is a front-lit PVC substrate offered in a variety of weights and widths ranging from 8'3" to 16'4". Peter Douglas, national sales manager for Cooley/Sign Products Division, says the product was developed in response to consumer requests. "The advantage of our seamless sign material is graphic placement," says Douglas. "Inevitably, wherever there is a seam you will have a dark spot when it is back lit and that impedes the ability to see the graphics at night." Glen Raven Custom Fabrics offers Sumbrella Firesist Plus, a flame retardant fabric woven from self-extinguishing fibers that meet the requirements of leading commercial building codes. "We developed Sunbrella Firesist Plus to meet a specific need in the market for a fabric that could not only meet fire codes, but also provide increased water repellency," says Al Johnson, Glen Raven's director of business development. With a good grip on the architectural elements of the building, the needs of the customer, and the required materials, you can help the client choose an awning style. There are many different awning shapes, including lean-toos, radius, domes, and waterfalls, to name a few. The shape helps set the mood for the business. Choosing the right style is important because the awning can change the entire face of a building ­ for better or worse. "Some customers have a box-shaped building and want to put a quarter barrel awning with domed ends on it," said Michael Gillum, head of the design and textile fabrication department of GPS Specialty Construction, Inc. "That detracts from the building." Likewise, if a building has arch top windows, a lean-too awning (shaped like half of a pup tent) would not match the architecture. A radius awning would be more appropriate in that case. Gillum says forest green is his bestseller and notes that black awnings have also become chic over the past few years. But companies with established logos have distinct color schemes; therefore, the trend is toward customized color. Eckerd's, for example, has its own shade of blue that is consistent throughout its marketing materials and signage. If the awning is sold as a sign, then graphic art becomes the next consideration. In fact, you have to consider the graphics before you complete the frame structure. With a lean-too awning, for example, the top half of the material contains graphic placements that are not obstructed. But if you don't plan properly the frame could interfere with the verbiage on the bottom portion of the awning fabric. "If the awning is over 20 feet long, it is generally going to be two pieces," said Douglas. "You have to find the break in the awning to make sure there is not a word where the bolt would be, because when you bolt it together you are not going to be able to see the word at night." How far is the building from the street? What type of street is it (two-lane, four-lane, etc.)? What is the speed limit (25 mph or 45 mph)? "You always want to put up graphics that are readable," says Douglas. "You don't have to put every item in the store on the graphic. You want something catchy." Once you've decided on the material and design issues, it's time to install the awning. Basically there are two options: the old way and the new way. Traditional awning installation requires building a frame to specifications using steel and bolts. But a new system makes fabricating awnings much less time intensive. 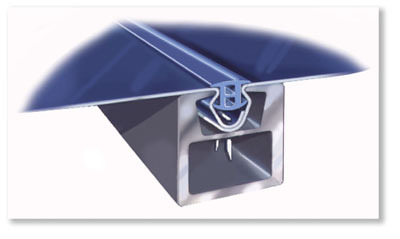 It is Milliken's Staple System, a user-friendly system for attaching fabric to a structurally sound aluminum frame. "It can take two guys between two and four hours to tension the face of an 8'X10' awning," says Steven LaFountain, Milliken vice president of sales. "With our Staple System a single person can tension the same face in less than 20 minutes." The system requires no sewing, can withstand winds up to 110 mph and a snow load of up to 35 pounds per square inch. The system also allows some unique shapes that would be extremely difficult and expensive to reproduce with traditional frames. The Domino's arch signs use the Milliken System with 3M's Panaflex film and specially designed extrusions. The orange curve-shaped piece under K-mart's "Big K" advertising is also constructed with the Milliken system. Finally, it is time to light the awning. Lighting styles depend on the purpose of the sign. Generally, you can down light (light from above), back light (light from within) or front light. Like shapes, lighting sets the mood for the establishment. So with that in mind, what kind of store is it? If it is a movie rental house, for example, you want internal illumination. Some video stores, and other retailers who do business at night, use two rows of double bulb, high output lights to give the environment a safe, bright feeling. Retail and fast food is typically backlit. Casual sit down restaurants like Applebee's, or high-end coffee shops like Starbucks, are typically down lit. 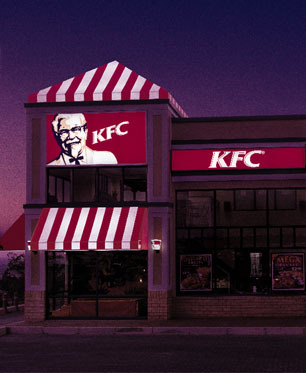 High-end restaurants and retailers find front lighting works best for them. The latest trend is eradicable substrates where you back light opaque materials to make the letters visually pop off the substrate. Less translucent materials require more light than opaque materials. Deciding how many lights to use depends on the height of the awning. The general rule of thumb is at least one single bulb fixture for every four feet of vertical height. If the awning is more than six feet tall then double bulb fixtures work better. Avoid lighting that overpowers the building or its surroundings. Experts say it is better for the awning to be under lit than over lit. Once the entire process is complete, take photos to add to your portfolio so that you can show your work to other companies looking to spend a little for a big change in the appearance of their buildings.